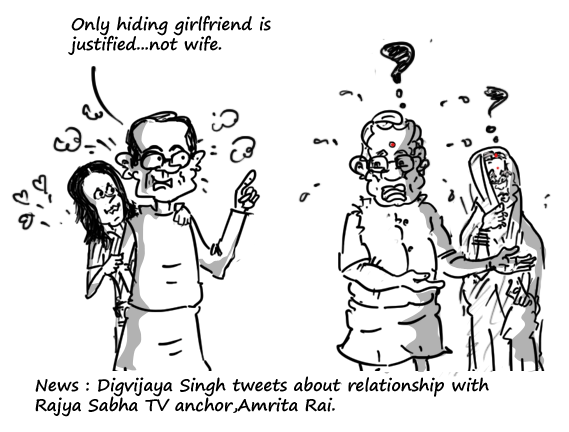 Outspoken Congressman,Digvijaya Singh,popular for his controversial remarks specially on BJP’s PM candidate,Narendra Modi,has revealed his relationship with Rajya Sabha TV anchor,Amrita Rai.In a tweet,he not only accepted his relationship with Amrita Rai but also stated that she and her husband have signed a mutual consent divorce paper. Ironically enough, he condemned encroachment in their private life although he has been bluntly commenting against Narendra Modi for not disclosing his marital status for long time. Brilliant jack …. Sharing it !! Brilliant one Jack … Sharing it!! These politicians are hypocrites. Apparently, different standards apply to different people.